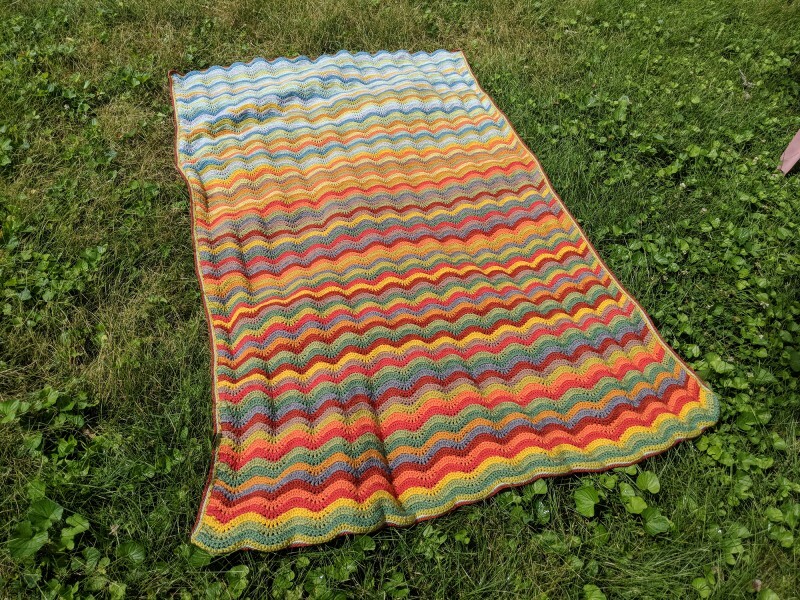 I’ve been wanting to make a Hue Shift afghan for years. Many, many years. 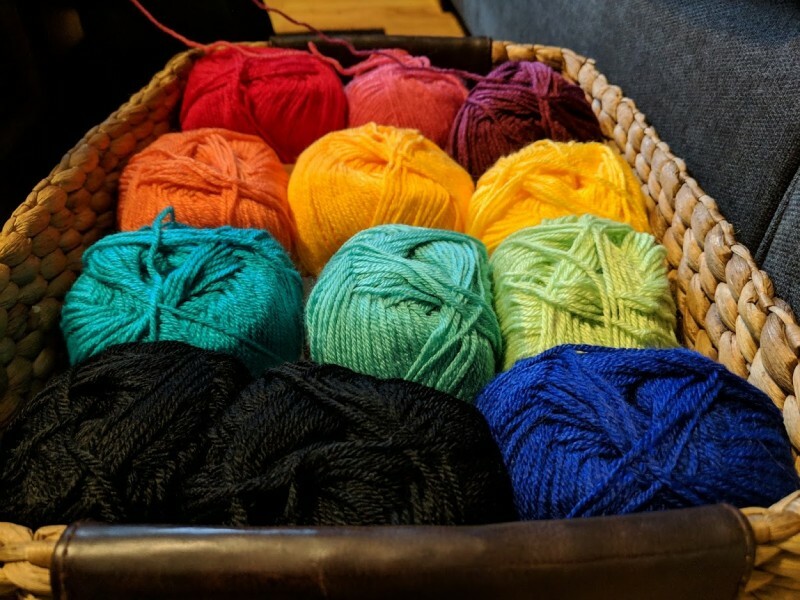 Before I got back into knitting and started getting better at it, I was a little intimidated by the mitered squares, and also by the prospect of knitting an entire blanket. 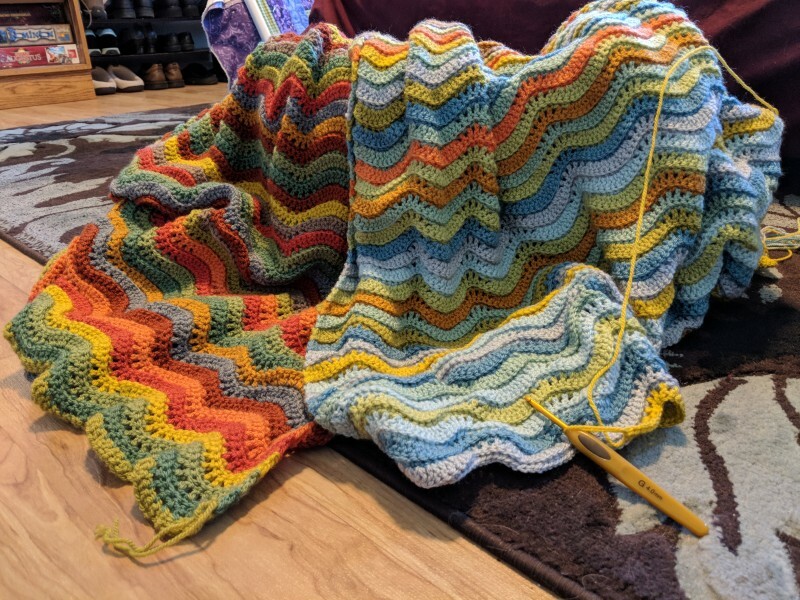 I’ve never knit a blanket before, and the Hue Shift afghan looked like it’d be a heck of an undertaking. 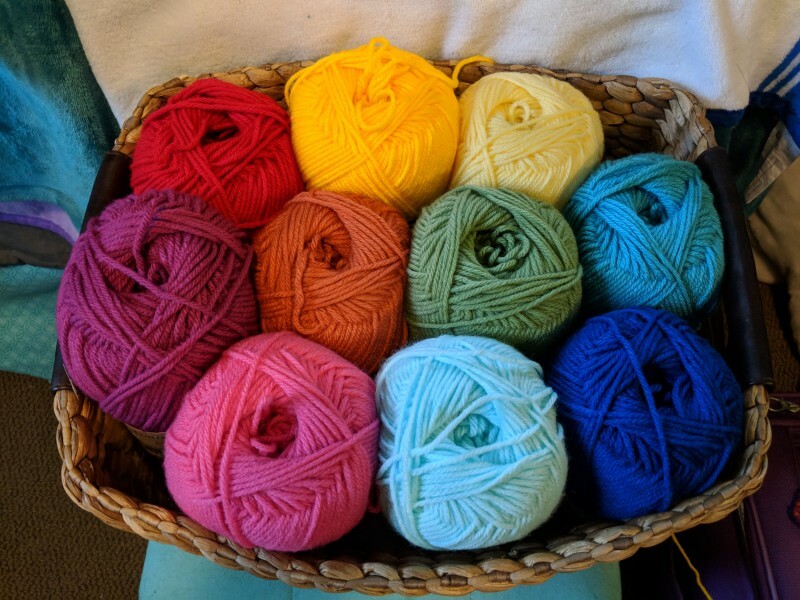 However, last week, I went and bought the pattern and headed over to Michaels to find the closest colors I could to what Knit Picks called for in the pattern. I think I came pretty close, but some of them are a little different — and that’s okay. 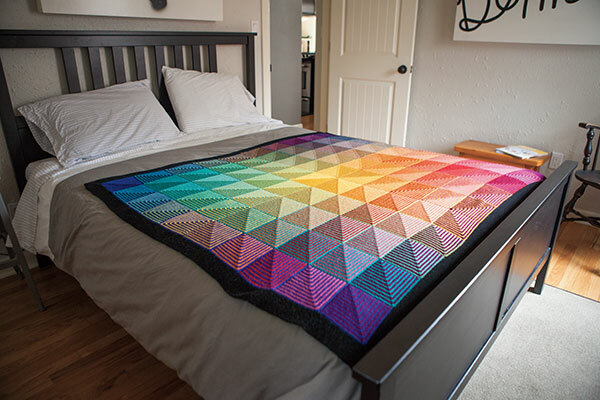 I want to make this blanket my own, since there are so very many other Hue Shifts out there. Why not try to be a little unique? 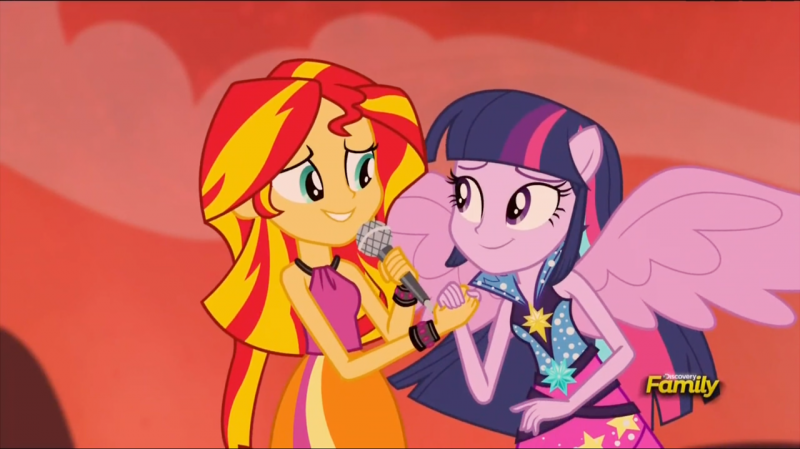 I do love how these colors look together. 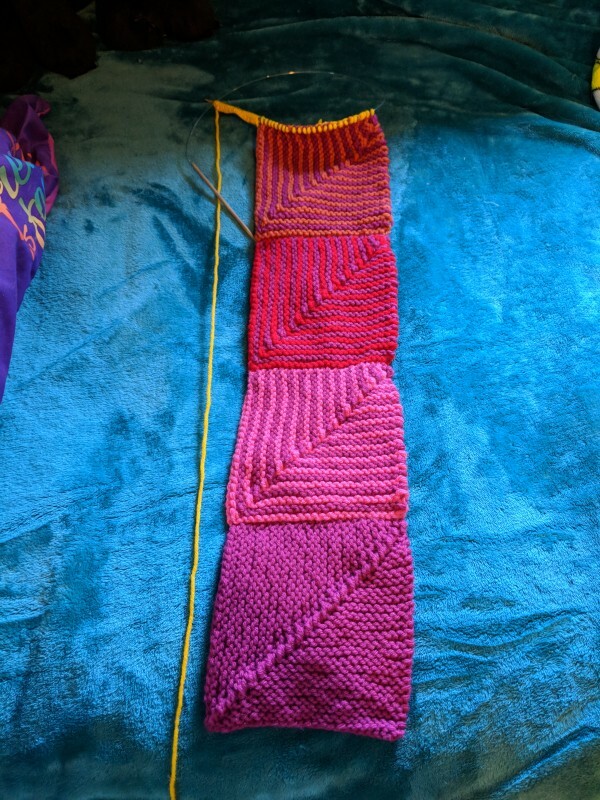 I just started the fifth mitered square – only 95 more to go, haha. 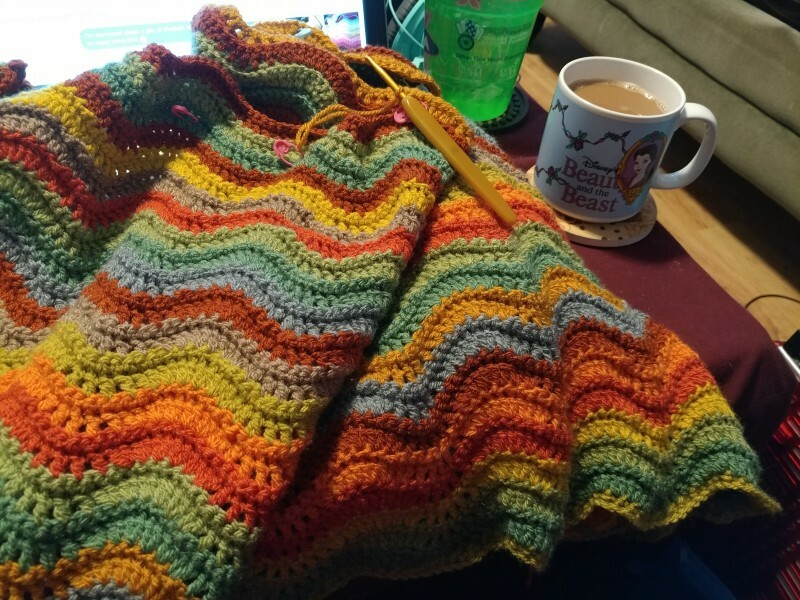 I was originally thinking “hey, if I crank out a square a day, I could have this blanket done in 100 days!” But I know me too well. You folks know me too well. 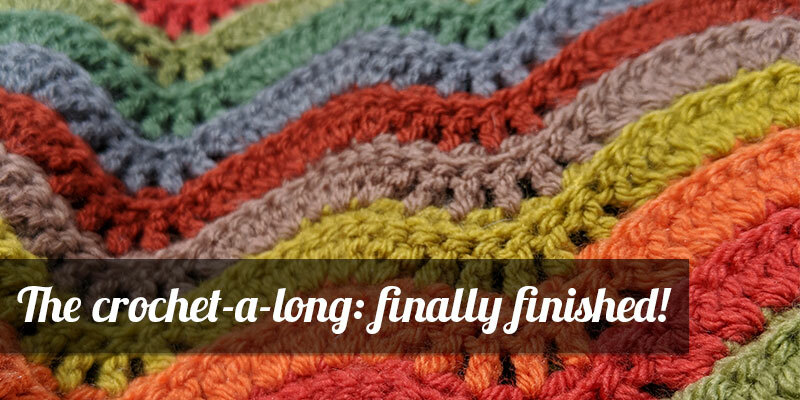 If I try to crank out the blanket on a deadline, it’ll end up taking me three years. Instead, I’ll work on it at whatever pace I can manage (and try not to give myself repetitive stress injuries in the process! ), and post some updates on its progress from time to time. 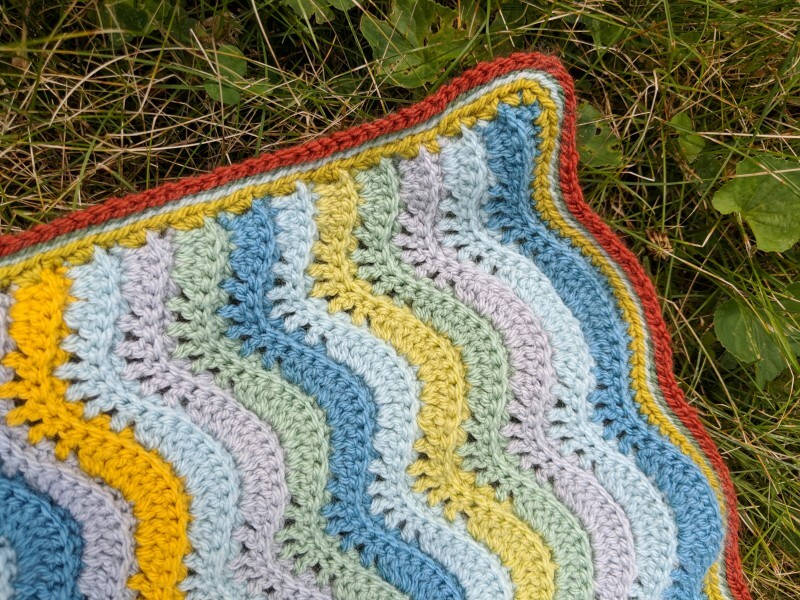 I want to enjoy making this blanket, instead of feeling guilty about it like I did with the Woodland Blanket. 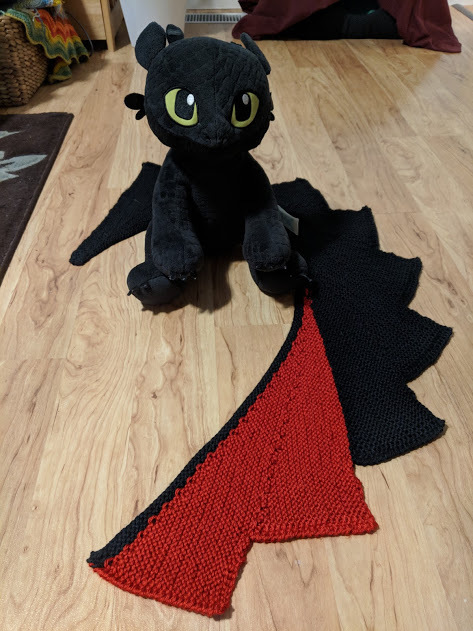 I’ve been wanting to make this blanket for so long, and I can’t wait to see how it turns out. Well, it only took me six months instead of the two that the Woodland Blanket crochet-a-long was originally planned to last, but I finally finished! 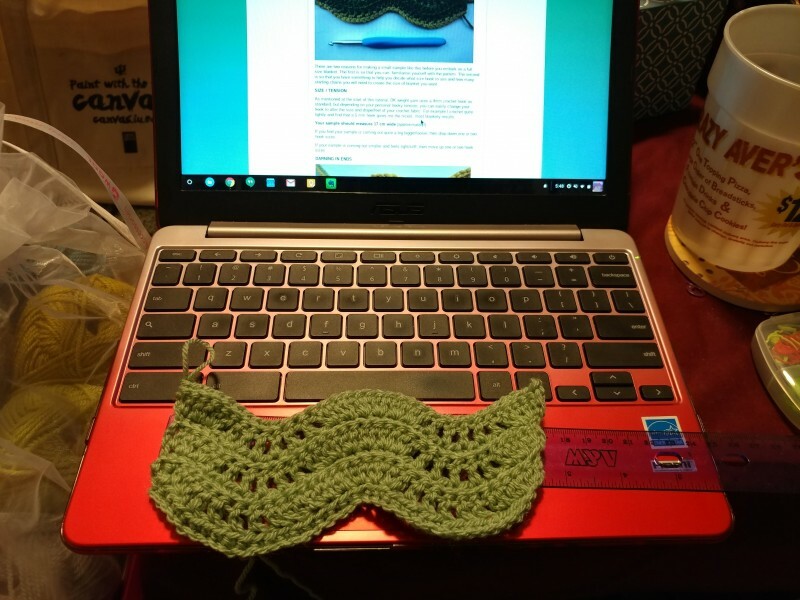 I’ll admit, some of why it took so long to finish was because I kept getting distracted by other projects. Which happens a lot to me, and which is why I’ve got piles of unfinished stuff all over the house. (From what I can think of off the top of my head, I’ve got two unfinished cardigans, two unfinished pairs of socks, one shawl I’m actively knitting, one I’ve got stashed in a box until I feel like working on it again, a third that’ll be the focus of a blog post next week, and a pile of stuff in the “Corner of Shame” that will probably never get done.) And the more I let the Woodland Blanket sit forlornly in my craft basket, the guiltier I felt about not finishing it, especially with so many other projects I wanted to do. And I only had 8 stripes and the border left to do. So I sat down one weekend and cranked it out. The border came out really well – I’ve never done a border like this before, it’s simply a couple of rounds of slip stitches. 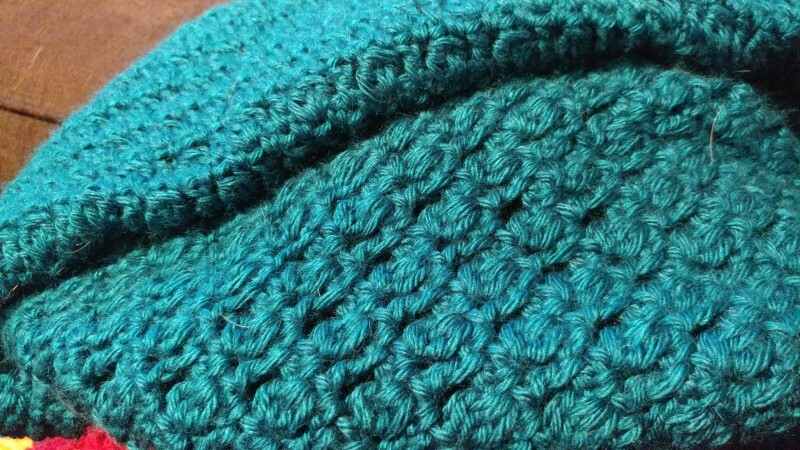 It’s not a hard blanket to do at all, especially once you get the hang of translating UK crochet terminology. 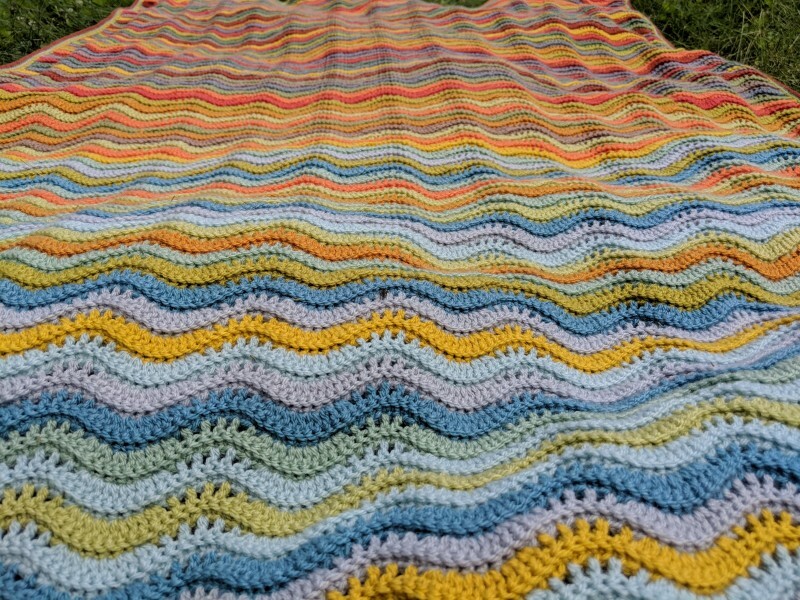 The wave pattern is soothing and rhythmic to work on, and I absolutely love the colors. The whole blanket looks fantastic, and I’m glad I resisted the temptation to just stop a few rows short from the end and call it done. It’s the first big thing I’ve finished in a while, and I’m so proud of myself for sticking with it. I especially love the gradual change from warm tones to cool blues. 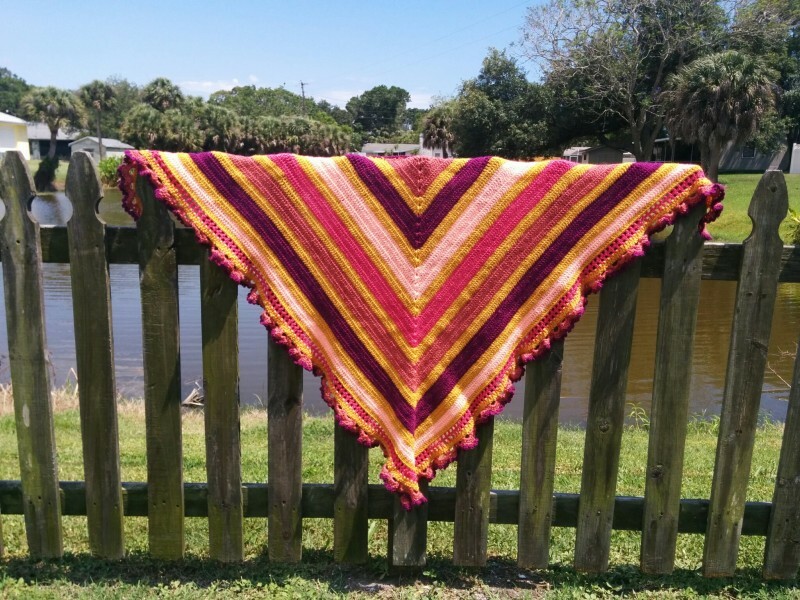 If you’re interested in making one of your own, the pattern is free on Attic24 (there are plenty of pictures included that walk you through the pattern) and if you want to create it in the same color scheme, you can buy the yarn pack here. 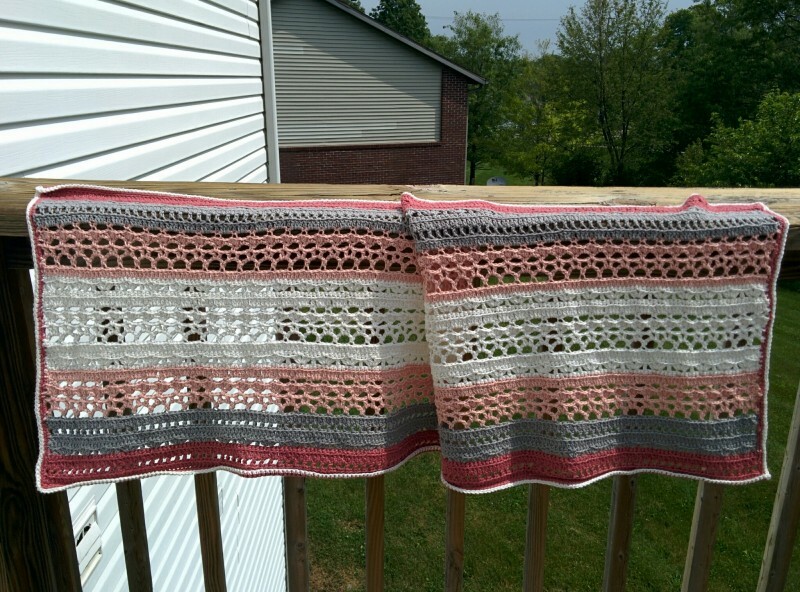 Well, the Woodland Blanket crochet-a-long I posted about a little while ago came to a close a few weeks ago. 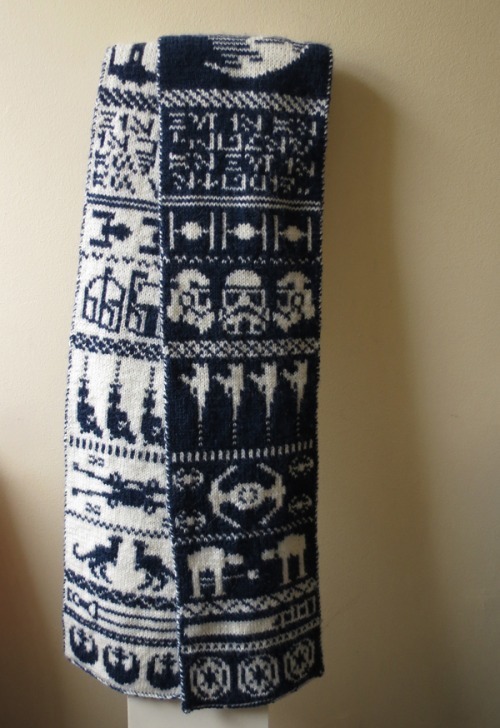 How’s my blanket looking, you ask? 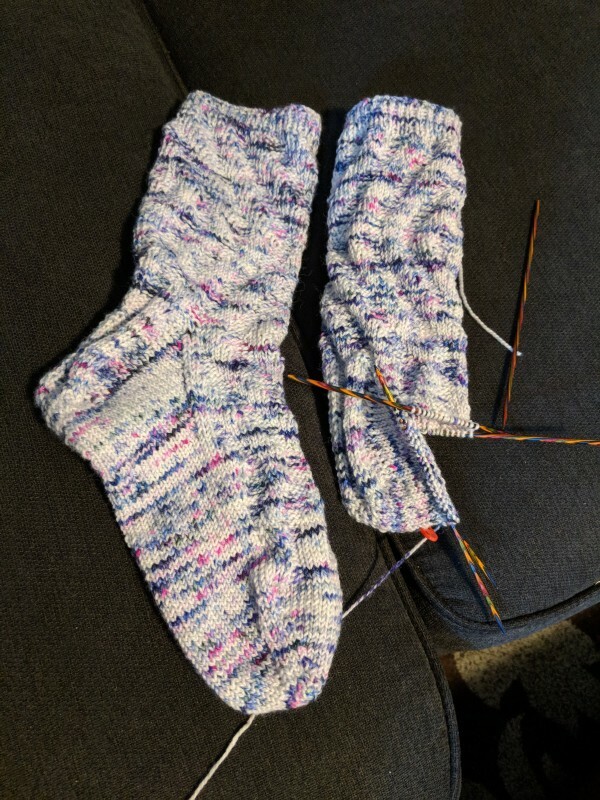 So I started a pair of socks. 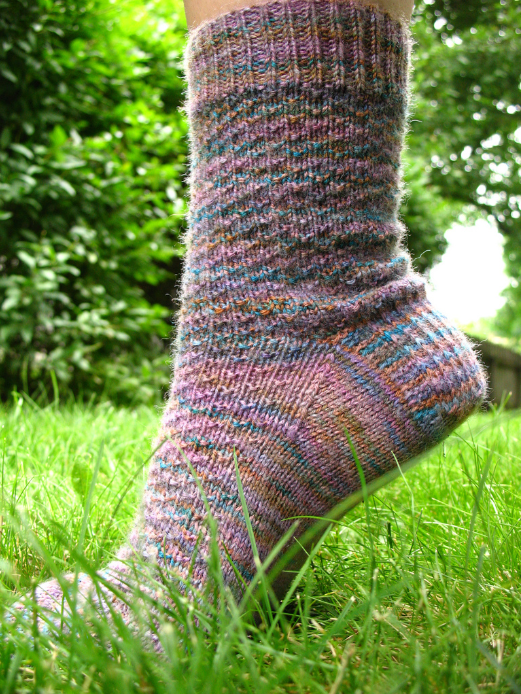 This sock is much further along now, I’ve rounded the heel at this point! And then I dug out a cardigan that I’d started a few years ago and hadn’t finished yet. 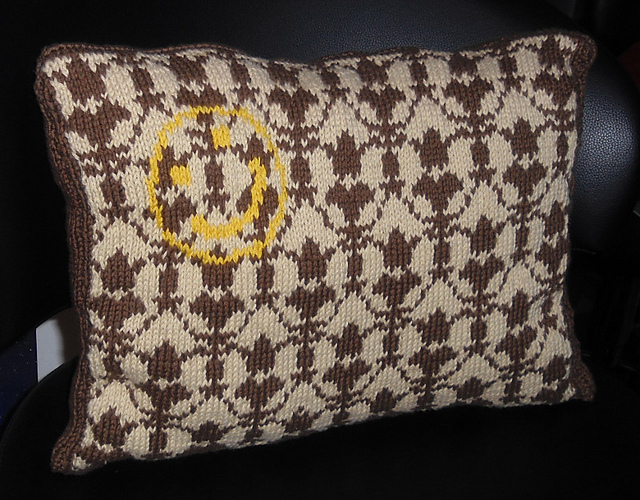 It still looks like an amorphous blob at this point, but the stitch pattern is pretty. 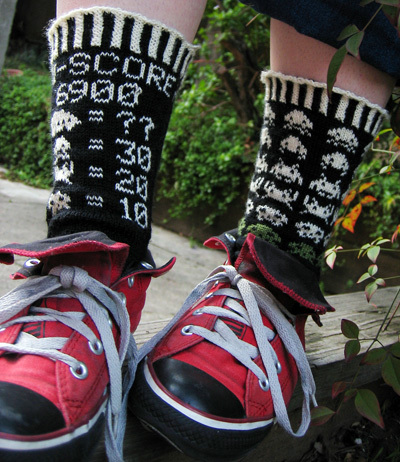 And then I decided to go back to another pair of socks I was working on and do some work on those. 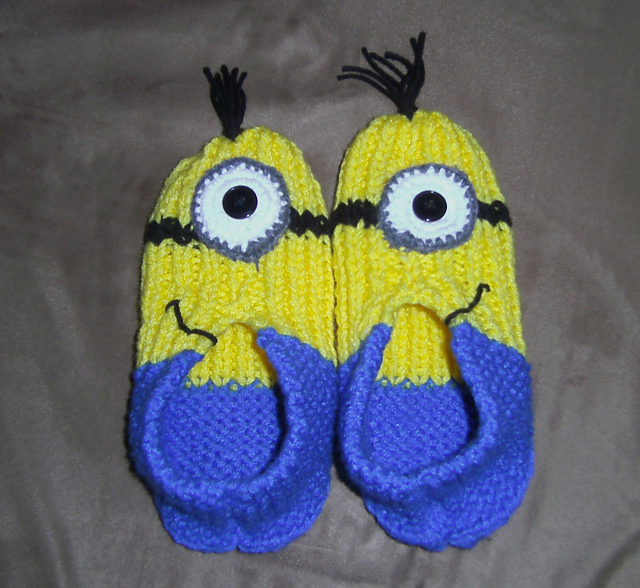 This pair is actually pretty close to being finished! And then I felt guilty about not working on the blanket and went back to working on that for a little bit, but then got distracted by socks again. 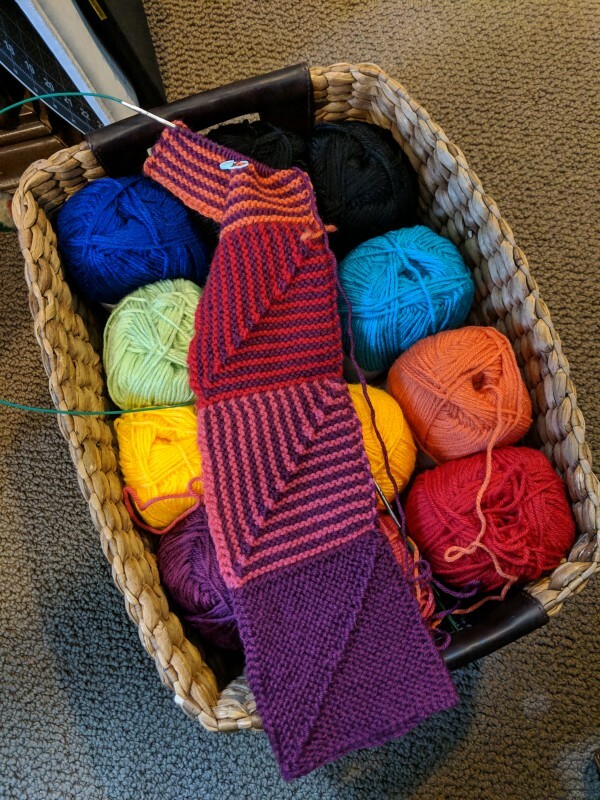 I know I’ll finish that blanket soon – I keep telling myself that I’ll finish it after I finish the socks with the zigzag pattern, that I won’t start any more projects until I get some others finished. Will I actually be able to stick to that, though? Who knows. 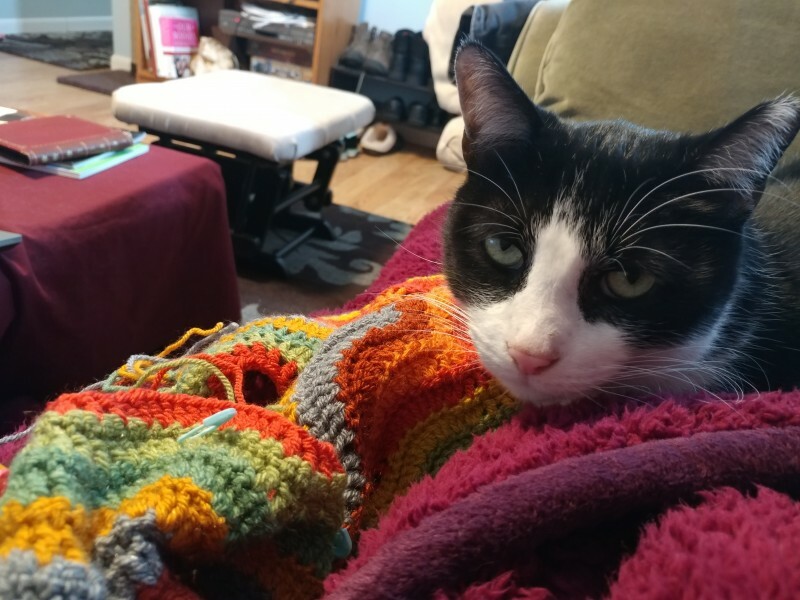 Anyhow, I’ll post about the blanket when I get it finished, I promise. And I will get that finished. 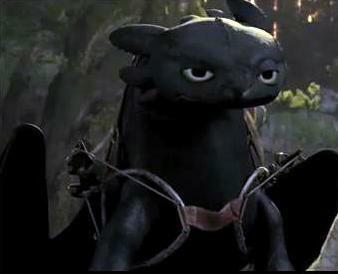 I’m determined. Every crafter has one (or more) – a tool kit they use to crank out their projects. I’ve actually got a handful of little tool kits, for each of my main hobbies. 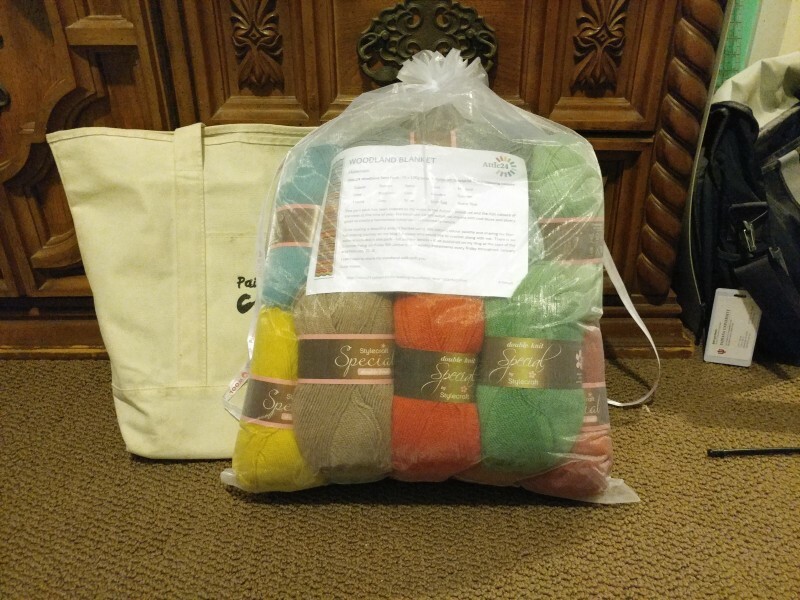 As I was digging around in my most frequently used one, my knit/crochet kit, I thought “hey, why not show off what’s in your yarn craft kit? 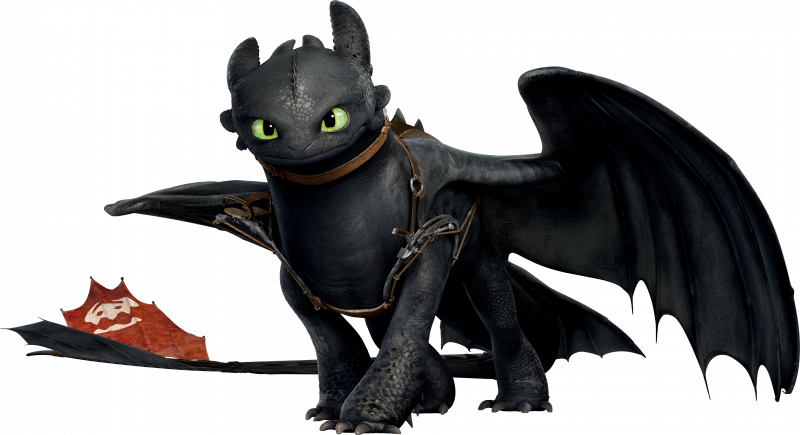 Someone might find it useful to see what you’ve got!” And this week’s blog post was born. 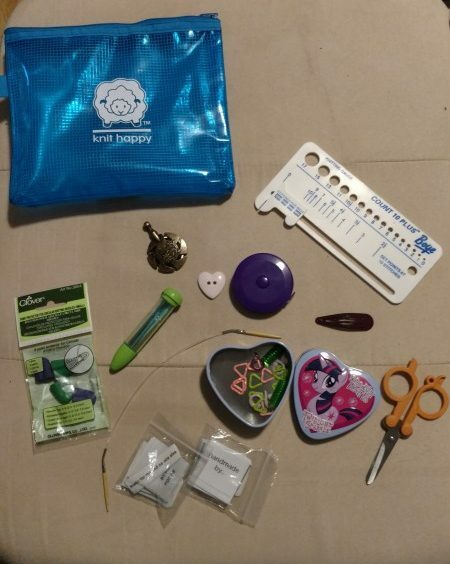 This collection of goodies helps me while I make yarn crafts. Knit Happy bag: I got this as part of a yarn swap years ago on Ravelry. I wasn’t quite sure what I’d use it for back then, but now it serves me well as the bag that holds all the tools I use frequently. Gauge counter: I’ve had this ever since I started crocheting, back in the early 2000s, but never really used it until recently. It’s been helpful as I try to figure out the gauge for my projects! 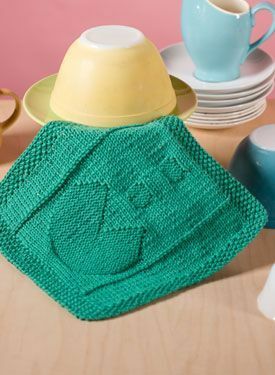 Yarn cutter: I love this. It’s way easier than carrying a pair of scissors around, and is far more likely to be travel friendly than most scissors. 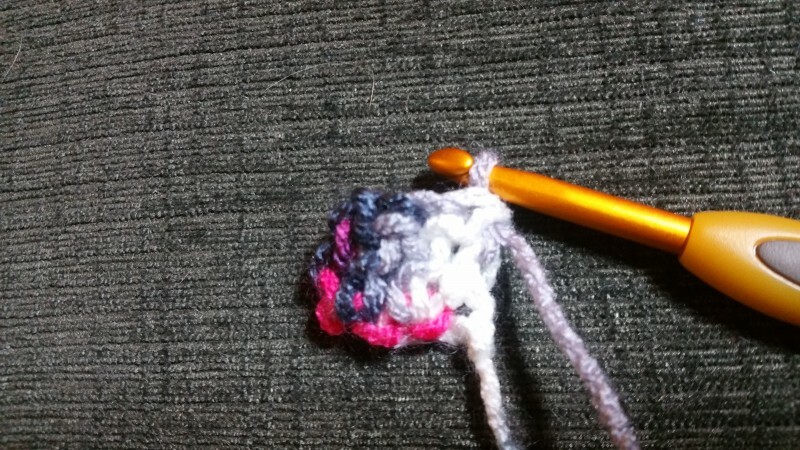 Plus, it’s fun having what my friend J calls a “yarn shuriken”, heehee. Buttons: you never know when you’ll need a button. This heart one was originally destined for a skirt I made years ago, then I almost put it on a sweater I made recently, and now it’s hanging out in my craft bag. 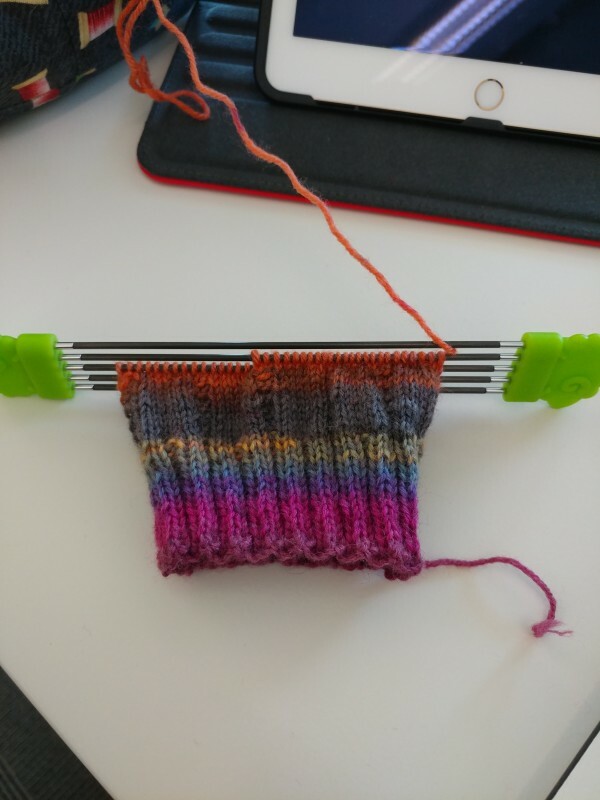 Measuring tape: This is helpful for so many reasons – measure the length of a tube sock, measure around a coffee mug for a cozy, measure myself to make sure an object will fit. It’s great to have. 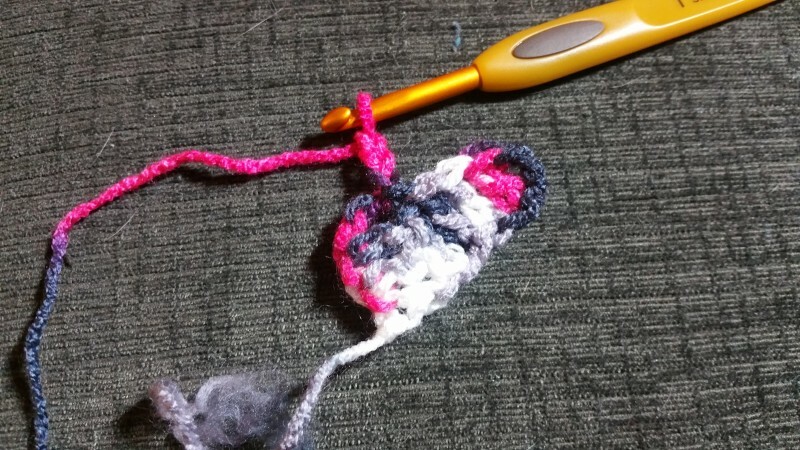 Needle point protectors: You have no idea how many times I’ve tossed a knit project into my bag, only to find that it’s slid off my needles by the time I’ve gotten to my destination. 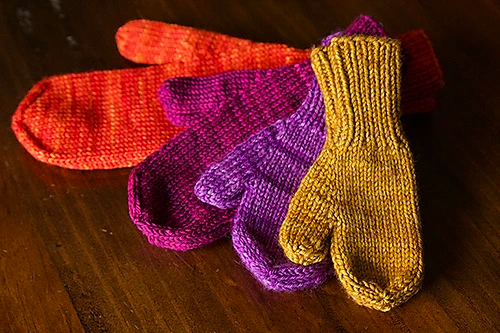 These things are a lifesaver – and a project saver. 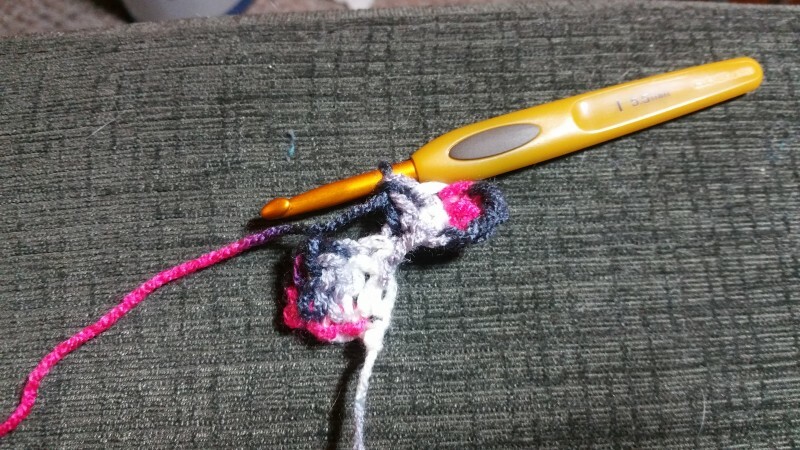 Yarn needles and needle holder: Most projects I make are going to need to be sewn together at some point. Having needles on hand is good – and having them all collected into one place is better. Itty-bitty circular needles: Honestly, I think the only reason these are in here is so I don’t lose them elsewhere. 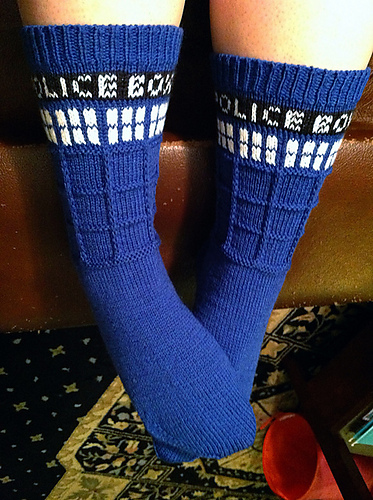 I’ve used them for making socks, but they’re not all that comfortable to work with, since they’re so wee. Tin full of stitch markers: Self-explanatory. Stitch markers are always needed. I’m actually going to have to reload this with some more, as stitch markers tend to disappear easily. Foldable scissors: Yeah, I’ve got the yarn shuriken, but sometimes it’s nice to use actual scissors. They let me get a bit closer to a yarn project than the yarn cutter. Plus, these guys collapse, too. 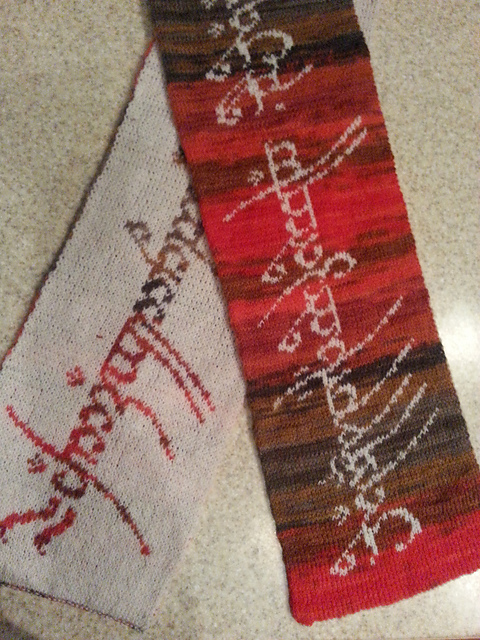 Labels, sassy and non-sassy: I’ve got these for when I make really nice garments for myself or others. The sassy ones tend to find their way into my own clothes. And that’s what I’ve got in my yarn tool kit! What do you all keep in your crafting kits? While I don’t ramble about work often here, I’m sure most of you longtime followers know I work for UITS at Indiana University – and every year, UITS hosts the Statewide IT conference, which is a fun few days of seeing what colleagues are up to, learning new things, and for me, teaching a workshop or two. This year, they’re doing something a little different. There’s going to be an Artists Showcase. 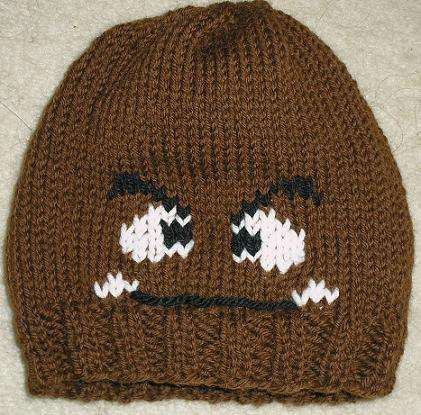 And I’ve submitted a “proposal” to show my crochet! I’ll likely hear back in a few weeks about whether or not I’ll actually get a table there to show my work, but here’s hoping that I do. 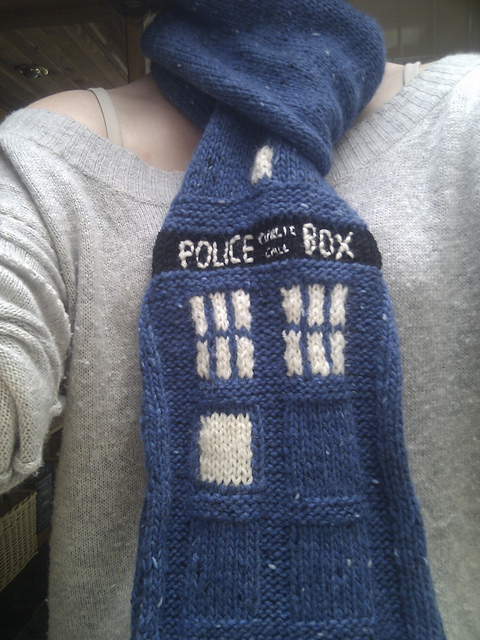 For the most part, my colleagues don’t really know about my crafty nerdiness, and tend to be surprised when I’m wearing something I made or have something flopped in my cube and realize I made it myself. It’ll be fun to get the chance to show things I’ve made, as well as hopefully make some new crafty friends who work for UITS as well. I apologize for the goofy picture, Siobhain! But yes, classy crafting is in full force. 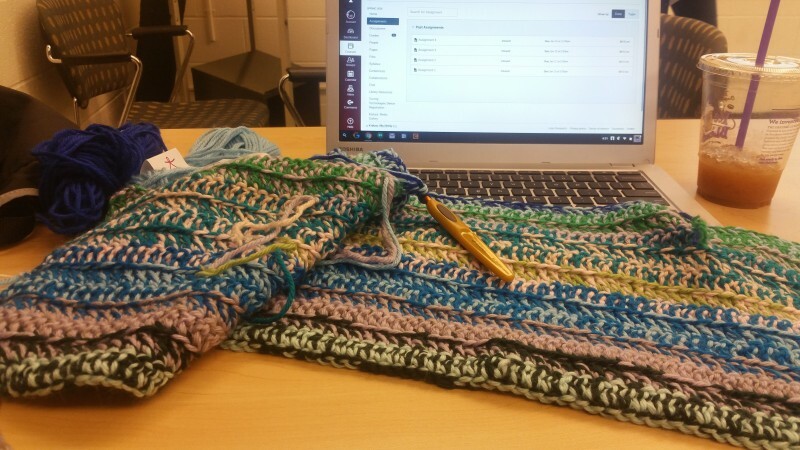 And this semester, so far, I have made a pretty blanket (which lives at my desk), and I’m working on a delicate shawl to go with my wedding dress and the focus of my post today, an ugly blanket. 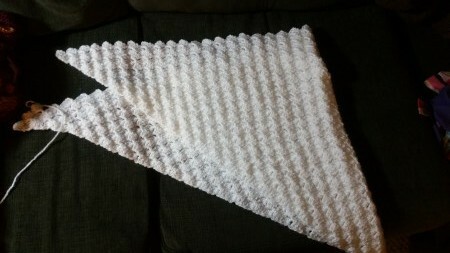 An ugly blanket, but oh so soft! This blanket came about due to having a huge mess of Mighty Stitch yarn at home left over from the corner-to-corner blankets I made for Ross and myself – it’s so soft, and I love working with it, but the mess that’s left is an odd arrangement of blues and greens with some purple, gray, pink, and white thrown in. 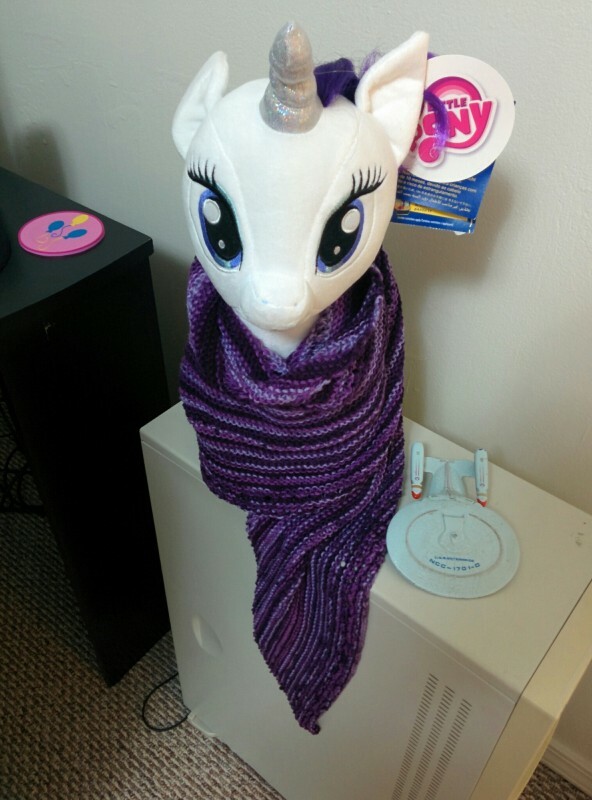 So, the only thing I can think of to do with all that yarn is to use two strands of it together and make a thick, snuggly, small, and ugly blanket. 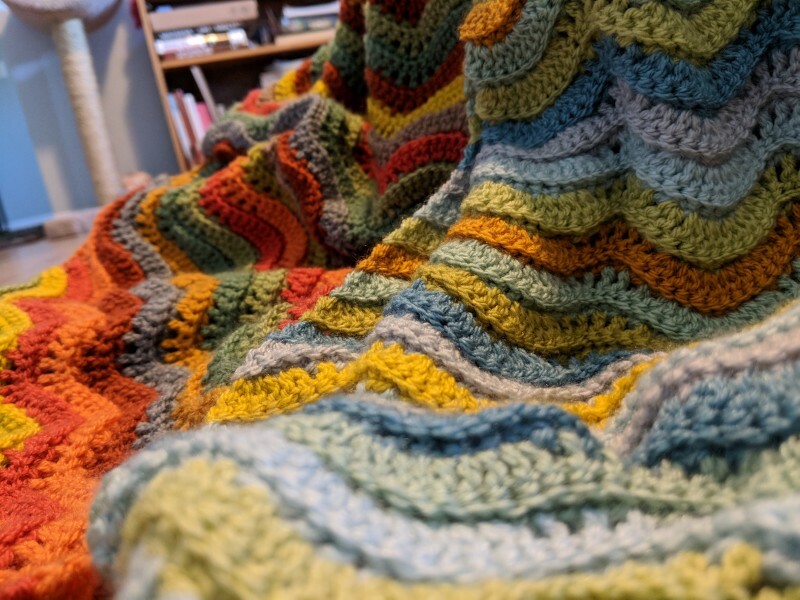 It’s actually a rather sentimental ugly blanket, considering it’s a combination of the yarn I used for both mine and Ross’s blankets, and it makes me feel warm and fuzzy, figuratively as well as literally, to work on it. 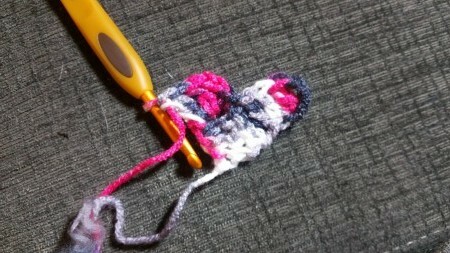 I haven’t done much work with two strands of yarn before – it’s a little trickier to work with, that’s for certain, but it results in a really unique look. One of my classmates in Metadata, Samantha, said that Ugly Blanket kind of resembles some of those woven rugs you might see in specialty shops, and I think she’s right. It doesn’t really stop it from being somewhat homely-looking, though – some of these colors don’t quite go together well, heheh. I’ve never actually worked on a blanket in class before. I figure at some point, it’ll get unwieldy, and I won’t be able to cart it along with me anymore. Until I get to that point, however, I’m gonna load it into Mia (or into my backpack, which I shall take on Mini-Mia, my new bike! 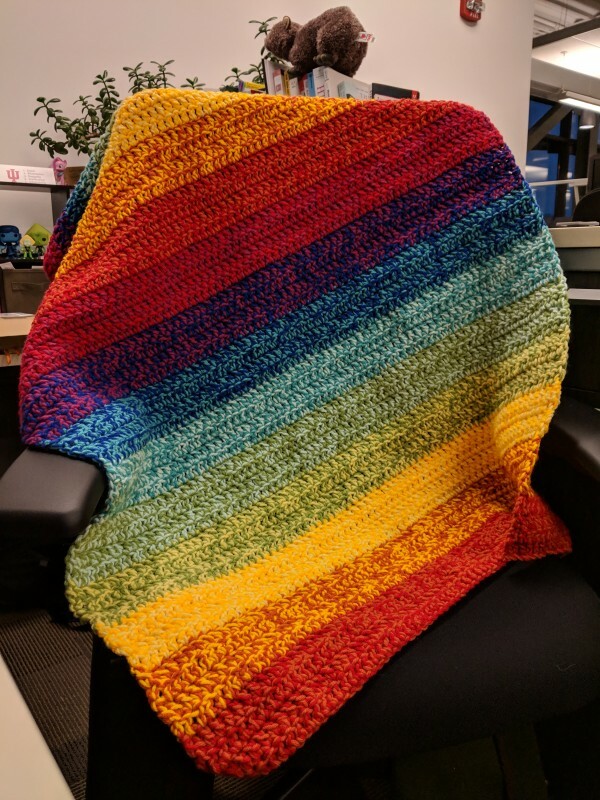 ), and drag it to Metadata and Public Library Management every week this semester, and keep adding onto this semester’s big classy crafting project: the ugly blanket. 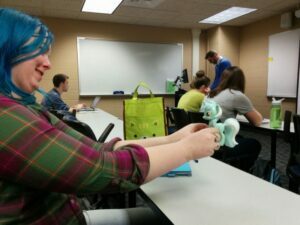 It’s been quite a while since I’ve done a Classy Crafting post – and I was particularly productive last semester when it came to crafts! 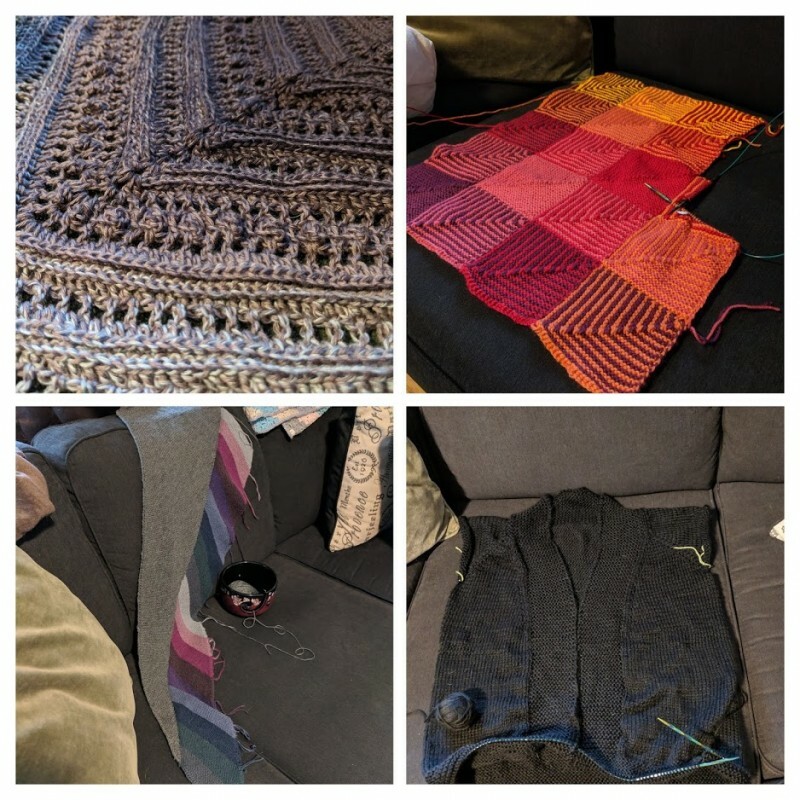 I finished two shawls and started a third, and worked on a couple of other random projects that have ended up stuffed in my “in progress” pile in the basement… Here’s the crafts that I finished this semester, though, that I worked on during my spring classes! 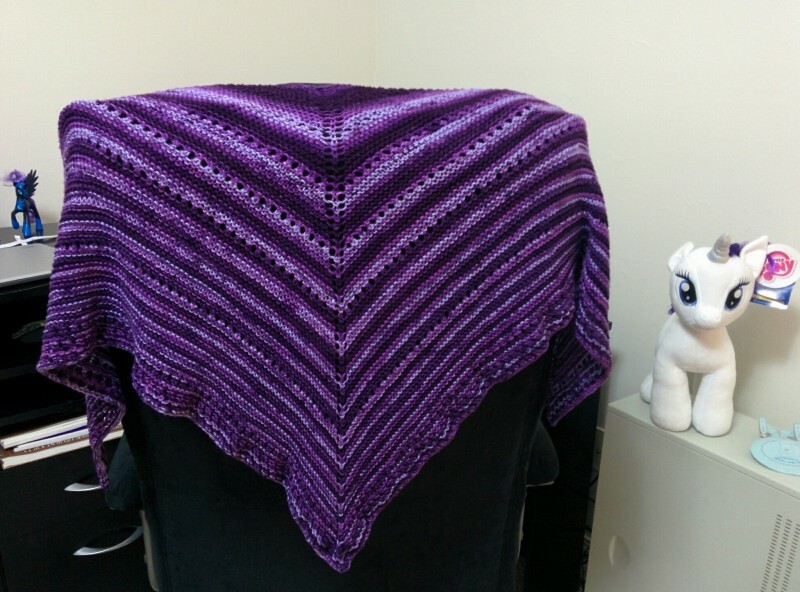 I made this shawl as a birthday present for Ross’ mom, and draped it over Rarity (who was also part of the gift)! She absolutely loved it. 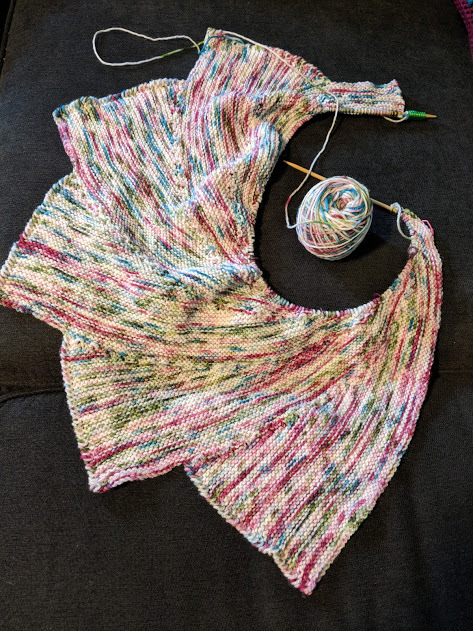 I had a great time making the shawl – it was my first knitting project in a very long time, and my first project with sock yarn. 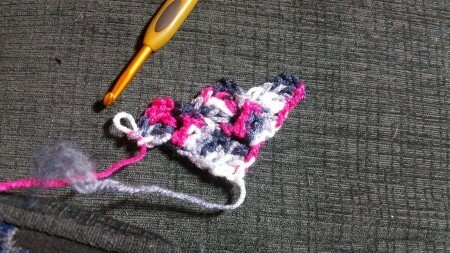 The way the yarn striped as I worked on the pattern was awesome to see, too! 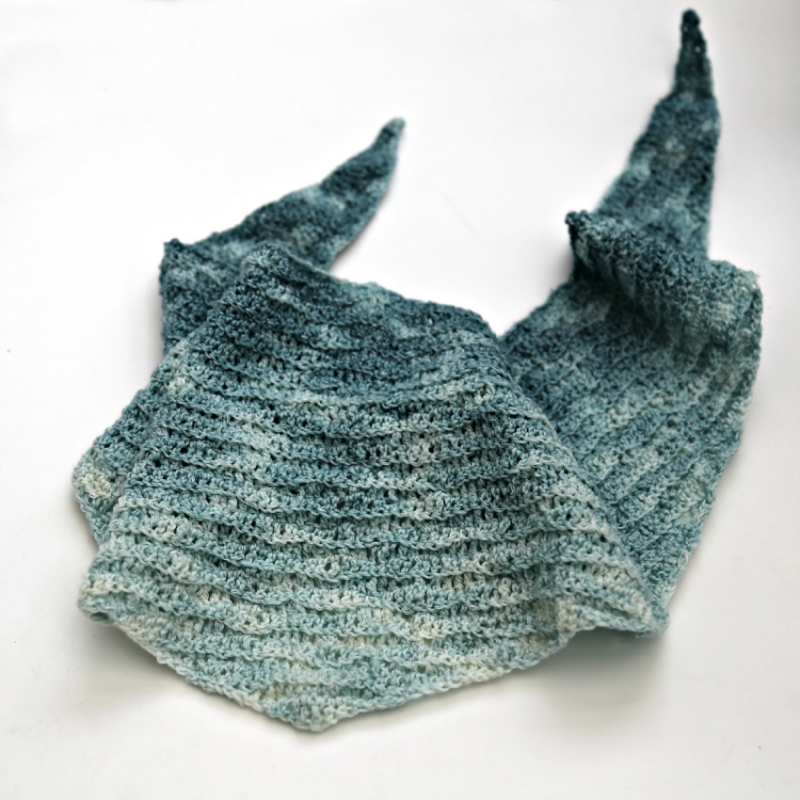 The idea for this shawl was born from a Knit Picks sampler pack of yarn I bought – I fell in love with the colors, and had been wanting to make this wrap for a while, and after some creative splitting up of the shawl so it could work with four colors instead of two, I got to crocheting. 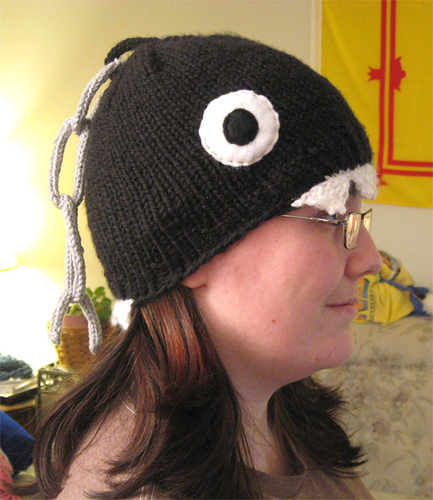 It ended up coming out beautifully, and the yarn is incredibly soft. I wore this with a matching dress to Ross’ mom’s wedding a few weeks ago, and got lots of compliments on it! 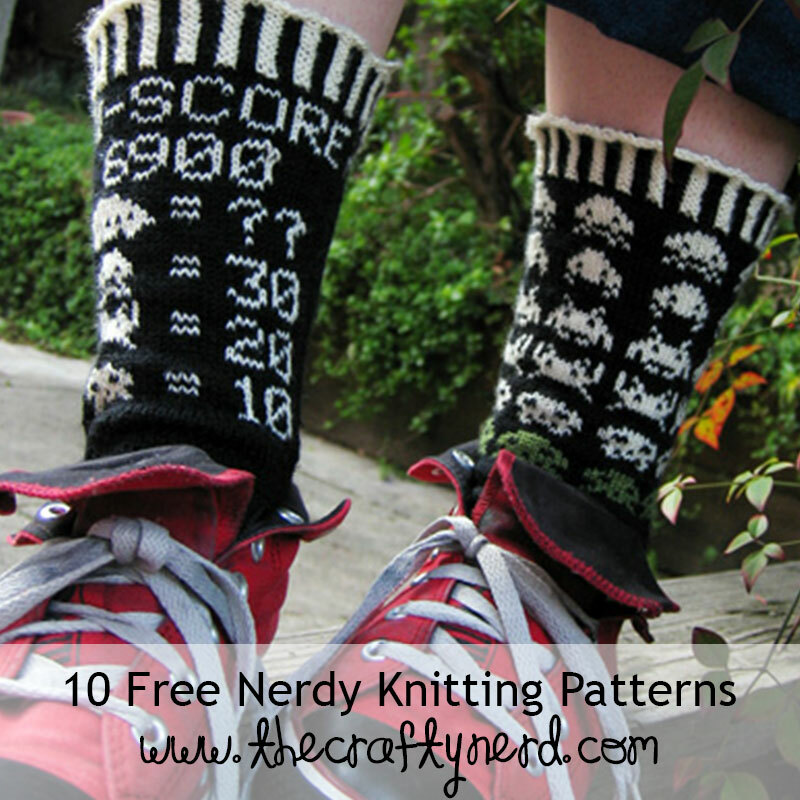 10 Free Nerdy Knitting Patterns! Wow! 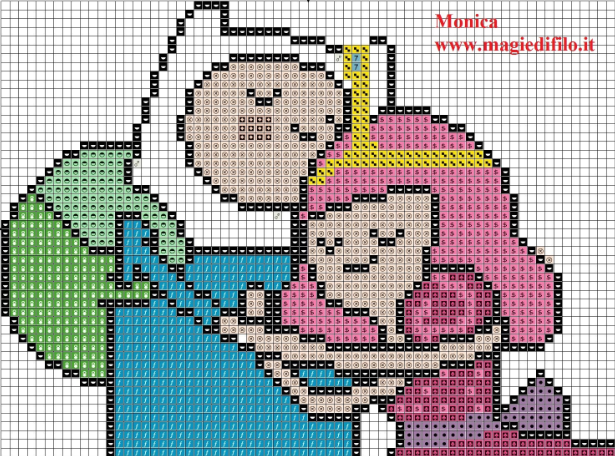 My last post, about ten free nerdy cross-stitch patterns, was a huge hit – over 300 hits in two days! 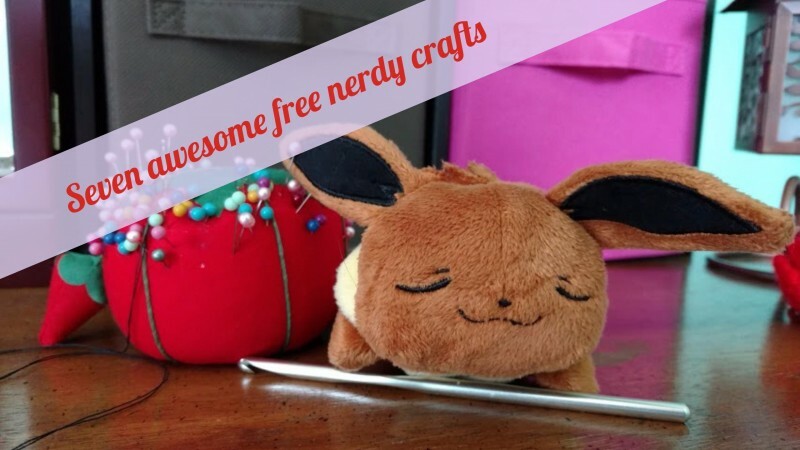 I take it that everyone’s looking for some new nerdy projects to keep themselves occupied with, so for my knitting fans, here’s ten awesome nerdy knitting projects – that are all free, of course!